Rifling through some old backfiles I stumbled upon this great photo of my buddy Jad and a 50lb pig we smoked in his backyard a couple years ago. We had a few dozen people over and threw an old fashioned pig picking party, the kind you don’t associate with Texas but the sort that’s commonplace in the Carolinas. 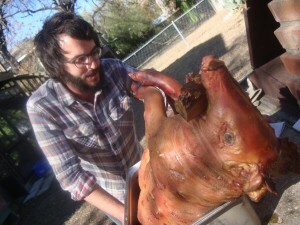 This entry was posted in Texas Barbecue Photos and tagged barbecue, how to barbecue a 50 pound pig, jad duplechain, pig roast, texas. Bookmark the permalink.